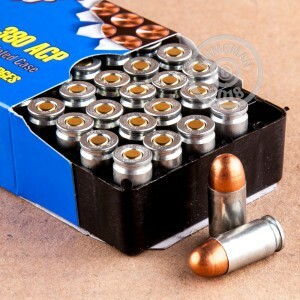 This .380 ACP ammunition is perfect for cheap target practice with your carry pistol. 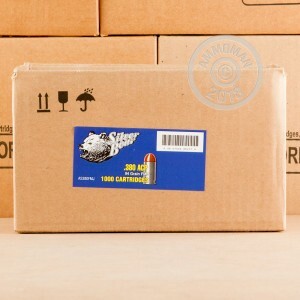 Each cartridge in this box of 50 fires a 94 grain bimetal jacketed bullet at a muzzle velocity of 1,000 feet per second. These rounds non-corrosive Berdan primers and non-reloadable steel cases plated with zinc for more reliable cycling. They have magnetic properties which make them unsuitable for some indoor ranges, so check with your range if unsure. 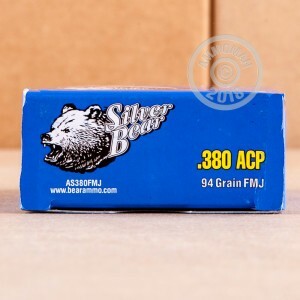 Silver Bear ammo is made at the Barnaul Machine Plant, a historically important facility that produced half of the Russian army's ammunition during World War II. My wife put 30 rounds through her new Ruger LCP without a hitch. My wife's Bersa .380 at this stuff up with no problems at all. I'm ordering more on my next order!